The existing taxi station at the Transit Center will be closed due to construction at the Transit Center beginning February 5 for the SMART rail extension to Larkspur. Taxicab operators expressed concerns at the most recent City Council meeting that without a new cab stand in place, the transit using public and city streets would be heavily impacted. In response, Public Works crews created a temporary taxi stand. The work included street markings, red curb painting and parking meter removal. 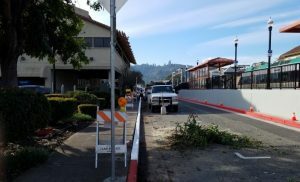 The new taxi stand is located on East Tamalpais, alongside the SMART Train passenger platform. Transit riders downtown looking for a taxi connection will have a short walk across the street to the new taxi stand. City Council approvad the taxicab stand at the Council meeting on Monday night. Staff received direction from City Council to not pursue a taxi permitting process at this time, however that may change depending after monitoring activity for an extended period of time at the new taxi stand.